During the 2016 campaign President Trump stated that clean water would be a top priority of his administration, telling ScienceDebate.org “it may be the most important issue we face as a nation for the next generation.” Now is the time to make good on that commitment. While all Americans know water is a precious resource, most of us take it for granted – until it’s not there when we need it. Today, approximately 1.8 billion people around the world lack access to safe drinking water and nearly 2 billion people lack access to sanitation. Water-related diseases are the second leading cause of death in children and a major cause of stunting. Too many Americans, as well, have come face to face with water problems in recent years, from Flint to California. But beyond the compelling human health and security reasons for paying more attention to water security, there is the national security argument. On the global stage, where the president has said he wants to exert stronger American leadership, water scarcity is undermining economic growth, limiting food production, and becoming an increasing threat to peace and security. According to the recent National Intelligence Council report, Global Trends: Paradox of Progress, “more than 30 countries – nearly half of them in the Middle East – will experience extremely high water stress by 2035, increasing economic, social, and political tensions.” The tensions caused by unsafe or unavailable water can drive people to desperation and even violence when exacerbated by other factors of social and political strife. Given the dire straits of many of the world’s key water sources in regions important to U.S. strategic interests, water security and hydro-diplomacy must become more central to American foreign policy decision-making. The 2011 Arab Spring uprisings marked a turning point in recognizing that environmental stresses can play a part in sparking significant unrest. However, the fragile Middle East is not the only region under pressure from inadequate freshwater supplies for growing, urbanizing populations with rising incomes. Worldwide, extreme weather events, including droughts, torrential flooding, and storm surges, are provoking migration and domino-like dislocations with widespread consequences. The good news is that the president has assets at hand and infrastructure in place to prevent these pressures from spiraling out of control. As mandated by the Senator Paul Simon Water for the World Act of 2014, President Trump must issue a Global Water Strategy by October 2017. This strategy will be the first of its kind in the U.S. government, aimed at better coordinating the water activities of a number of agencies. It’s also an opportunity to elevate water in global security arrangements in recognition of its strategic and economic value. We recommend a three-pronged strategy for doing so. First, the U.S. should mainstream water security into key national security and foreign policy decision-making processes for strategic regions of the world. This would include day-to-day diplomatic engagement as well as long-term strategy. We know that water exacerbates tensions between India and Pakistan, between the countries on the Lower Mekong, in the Andes and throughout the Middle East. The United States has the power to help broker new transboundary agreements and revise existing ones to make them more flexible in the face of 21st century water challenges. The U.S. government can also address root causes of some transboundary conflicts with more efforts like the Lower Mekong Initiative. Tackling contentious issues such as Laotian hydropower construction would foster unity among downstream countries and counter China’s influence. Improving hydro-diplomacy is about developing mutual trust before bad things happen – never an overnight process. Focusing on high risk, high consequence water problems in strategic basins, such as the Nile, Tigris and Euphrates, Syr Darya and Amu Darya, Indus and Brahmaputra, and Mekong, offers opportunities to preempt greater troubles down the road. Sometimes, effective interventions will require a whole-of-government approach and full use of all diplomatic tools. At other times, the United States will need to work behind the scenes due to larger geopolitical issues. However, successes in hydro-diplomacy can spillover to build mutual confidence for addressing less tractable diplomatic challenges, including in the Middle East. To enable such strategic direction on hydro-diplomacy, the president should establish a public-private Center for Water Conflict Prevention. Such a center would mobilize both an all-of-government approach as well as enable the private sector to be an essential dimension of the economic opportunities created. The center would also align priorities and resources across multiple agencies with relevant missions in diplomacy, development, defense, intelligence, science, and technology. Second, the United States should advance water data collection and sharing. Most water agreements today were concluded before the era of big data analytics and digital forensics. However, the emerging field of water intelligence, often relying on open source material, can provide more comprehensive and actionable information than was previously available. One challenge is that many countries treat water data as a matter of national security, making them unwilling to share or cooperate with others. Yet the United States has assets – NASA, NOAA, and USGS – that can generate accurate and openly accessible water data. NOAA’s new National Water Center in Alabama could be instrumental in demonstrating how this data can inform decision-making at all levels of government, here and abroad. These capabilities should be leveraged through hydro-diplomacy and used to provide support to the Center for Water Conflict Prevention. Using the model of the Famine Early Warning Systems Network, which is led by USAID and supported by multiple other agencies, the data collected by U.S. science services could be put to work in developing much needed early warning systems to help countries predict and plan for water-related crises. Climate and weather data can be correlated with other social, behavioral, and governance indicators, and vulnerability assessments can help the U.S. government and its partners understand risks before stresses rise to the level that compels mass migrations or violent conflict. Third, the U.S. should make water innovation a key priority in water diplomacy. Innovation in water encompasses everything from compiling and disseminating best practices on water policy and governance to developing and distributing technologies that can improve efficiency and quality. Public-private partnerships with U.S. water and infrastructure companies can aid in commercial diplomacy as well as in disseminating American technologies, services, and expertise, contributing to U.S. competitiveness and economic growth. Just in the area of water purification technologies, American exports exceeded $1.8 billion in 2011. The Trump administration should invest in programs such as the Water Infrastructure Finance and Innovation Act to encourage further innovation as well as strengthen coordination between export assistance programs to ensure breakthroughs can be applied globally. Secretary Tillerson, as he well knows from his time in the oil and gas industry, will need to support water-related “technological innovation and institutional change” in order to achieve his foreign policy objectives in the area of energy diplomacy too. When we explore outer space, a central question is whether planets can support life. The first test is whether there is water. Our own planet is no different. The time is now for the administration to commit to President Trump’s objective to ensure “every person in the world has clean water.” Leading on water issues will not only help to avert conflicts that could jeopardize U.S. interests, but demonstrate American commitment to peace and prosperity globally. Sherri Goodman is a senior fellow at the Wilson Center and the former deputy undersecretary of defense for environmental security at the Department of Defense. She is the founder and former executive director of the CNA Military Advisory Board, and former president and CEO of the Consortium for Ocean Leadership. Ruth Greenspan Bell is a public policy fellow at the Wilson Center, research associate at the Center for Decision Sciences, Columbia Business School, and visiting scholar at the Environmental Law Institute. Nausheen Iqbal is a research assistant at the Wilson Center and a visiting attorney at the Environmental Law Institute. Sources: Famine Early Warning Systems Network, Foreign Policy Journal, National Intelligence Council, The New York Times, ScienceDebate.org, Scientific American, U.S. Department of Agriculture, U.S. Department of State, U.S. Environmental Protection Agency, U.S. International Trade Commission, World Bank. 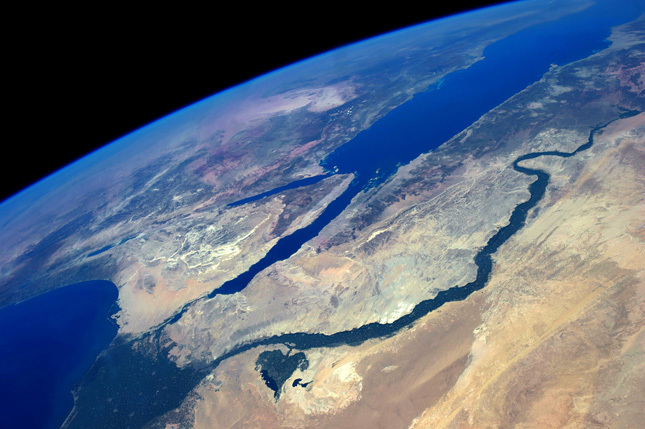 Photo Credit: The Nile and Sinai Peninsula from the West, courtesy of flickr user Stuart Rankin. Thanks for sharing this insightful letter. Satellite monitoring can really help forecast and understand risks (inundation, droughts, food security or famine , other extreme events) before stresses rise to the level that trigger mass migrations or violent conflict.Hydro-diplomacy can use such an innovation as a peacekeeping tool!